Katy is a well seasoned cross-player dating back to 2004. She spent eight amazing years on staff hosting. Katy has also judged for numerous events and even won an award or two of her own. 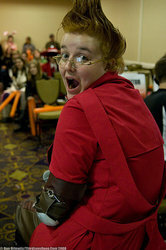 She continued on to help host events and panels at conventions such as Connecticon, Another Anime Convention, Anime Boston, and The New England Fan Experience. Along with hosting, came many parody videos which sparked the company Atomic Blue Productions. Coming soon, you'll be able to watch an original made for Youtube show: Kings and Queens (which she'll be acting/directing/writing for), as well as Vlogs and more parodies!